SOUTHERN STAR April 1941 "Dixie Press" Publications Volume 1 Number 2 Joseph Gilbert) Art R. Sehnert) - The Co-Editors Harry Jenkins - Art Editor Fred Fisher) W.B. McQueen) - Advisory Editors Lee B. Eastman: Poetry Editor T̲h̲e̲ ̲C̲r̲e̲w̲ ̲T̲h̲i̲s̲ ̲T̲r̲i̲p̲:̲ Milton A. Rothman Harry Jenkins, Jr. Jim Tillman Fred Fischer Morley L. R. Chauvenet Panurge Oliver Saari O̲n̲ ̲O̲u̲r̲ ̲N̲e̲x̲t̲ ̲V̲o̲y̲a̲g̲e̲: Art Schnert Bob Tucker George Fenton Jack Speer Leslie Perri Fred Fischer Phil Schumann Panurge T̲H̲E̲ ̲L̲O̲G̲ ̲T̲H̲I̲S̲ ̲T̲R̲I̲P̲ PROM THE DUAL CONTROLS ......... EDITORIAL ......... The Editors ..... 2 Yngvi Is Not A Louse! ......... Article ......,.. Elmer Perdue .... 4 THE MUNSEY PANORAMA .............. DEPT. ................. Panurge .... 5 ERB: A Critique .............. 9 Article ....... L.R,. Chauvenet .... 9 FROM THE STARPORT ............... DEPT .......Fred W. Fischer ... 11 Article ...................... Article .... Milton A. Rothman ... 15 THE TELECASTER .......... DEPT .......... Southern Fans ... 17 Black Magic & ESP ............... Article .......... Jim Tillman ... 19 Star Song ......,........ Poetry .......... Poetryfiers ... 24 FROM THE NEW YORK COM. OFFICE .... DEPT ................ Morley ... 26 Rebuttal To S. Ships & War ...... Article ......... Oliver Saari ... 27 THE PASSENGER LIST ............... DEPT ........... Art Sehnert ... 29 FROM THE PASSENGER LOUNGE ........ DEPT ..........,. The Readers ... 32 FROM THE INTER. TRADING POST ..... DEPT ............... Swappers ... 39 Interior Illustration ........ Art ............ Fred Fischer ... 40 COVERS BY JENKINS THE SOUTHERN STAR is a supposedly bi-monthly publication which achieves that enviable status with distressing Infrequency. Published at 3600 Grand St., Columbia, S. C, and all advertisements, regularly contributed departments, subscriptions and letters should be sent to that address. 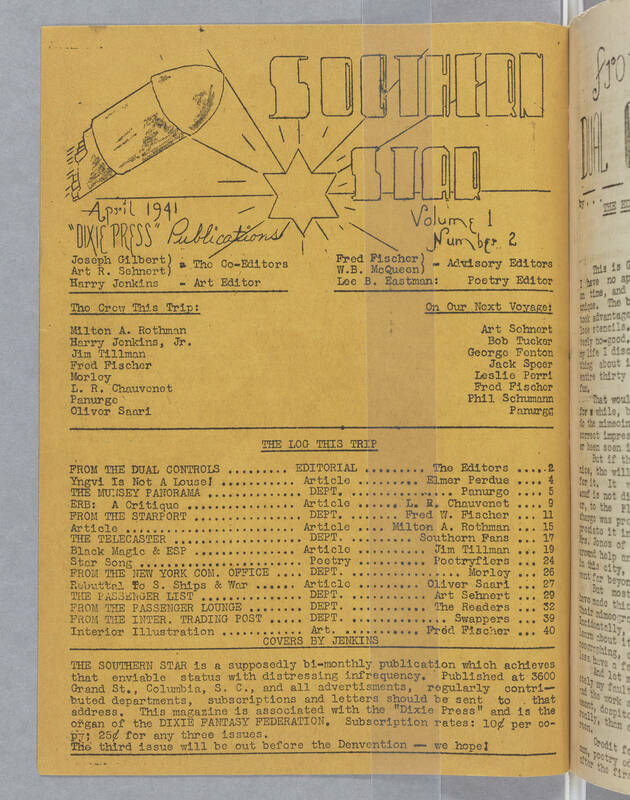 This magazine is associated with the "Dixie Press" and is the organ of the DIXIE FANTASY FEDERATION. Subscription rates 10¢ per copy; 25¢ for any three Issues. The. third issue will be out before the Denvention — we hope!